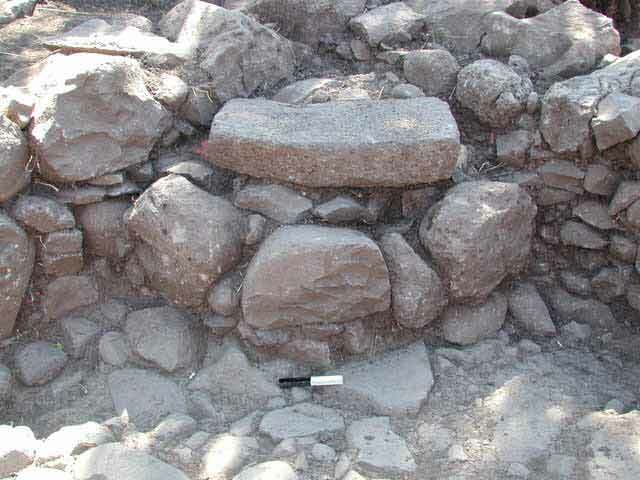 During July 2005, a salvage excavation was conducted at Fakhura, northwest of Qazrin in the Golan Heights (Permit No. A-4528; map ref. NIG 264260/767450; OIG 214260/267450), prior to the installation of an electric pole and the laying of an underground electric line. 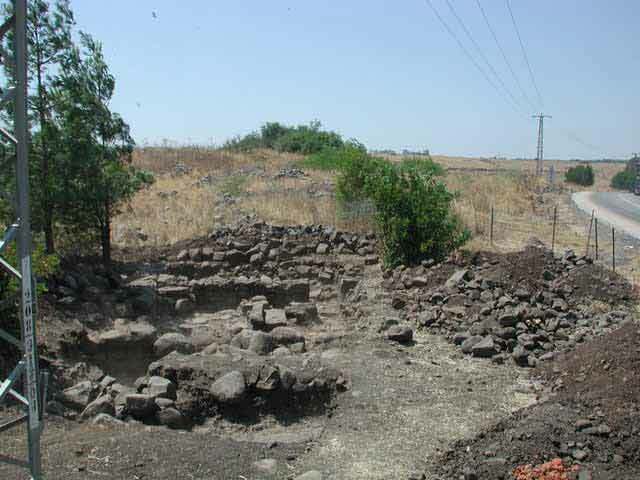 The excavation, undertaken on behalf of the Israel Antiquities Authority and financed by the Israel Electric Company, was directed by O. Zingboym and D. Avshalom-Gorni, with the assistance of Y. Ya‘aqoby(administration), V. Essman and V. Pirsky (surveying) and H. Smithline (photography). The site, which is located on a basalt plain next to the Nahal Meshushim channel, is known from the Golan survey (Epstein and Guttman 1972. Judea, Samaria and the Golan, p. 269). An excavation had been conducted at the site (License No. 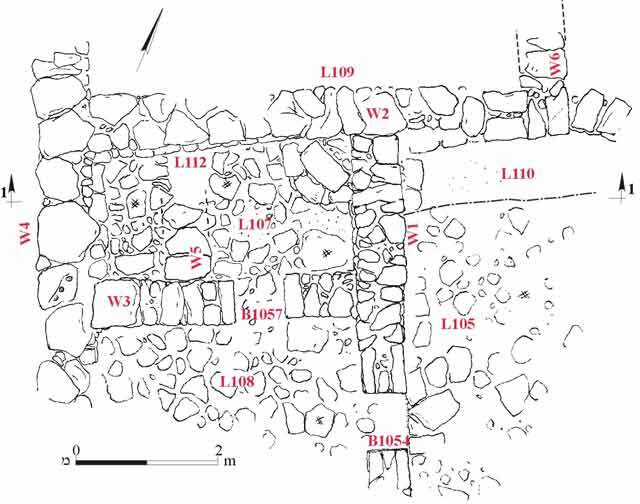 K-7/1972), revealing building remains, fragments of pottery vessels from the second and third centuries CE, pared lamps and coins as well as a Tyrian coin from the year 182/3 CE (HA 45:1; 47:1 [Hebrew]). The site was resurveyed recently (H. Ben David, 2005. The Jewish Settlement in the Golan during the Mishnah and Talmud Times in Light of the Finds from the Survey in the Southern Golan Heights. Qazrin. pp. 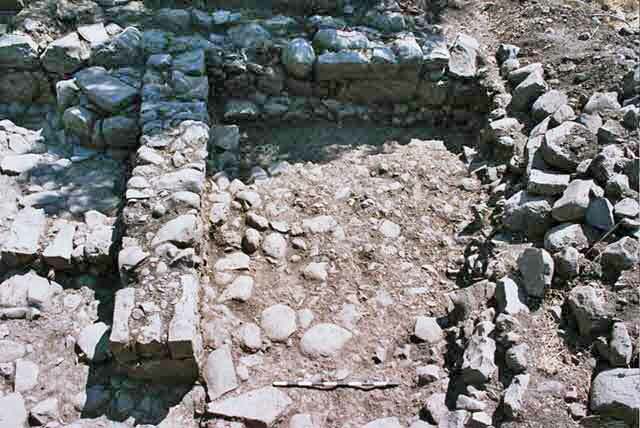 71–73) and a trial excavation was conducted in its northern part (License No. G-90/2002). An area (122 sq m; Figs. 1, 2) was excavated; bedrock was exposed in its southeastern part where hardly any finds were traced, suggesting that this part of the site was located beyond the bounds of the settlement. In the northwestern part of the area, a section of a building whose walls were built of roughly hewn basalt stones was excavated. 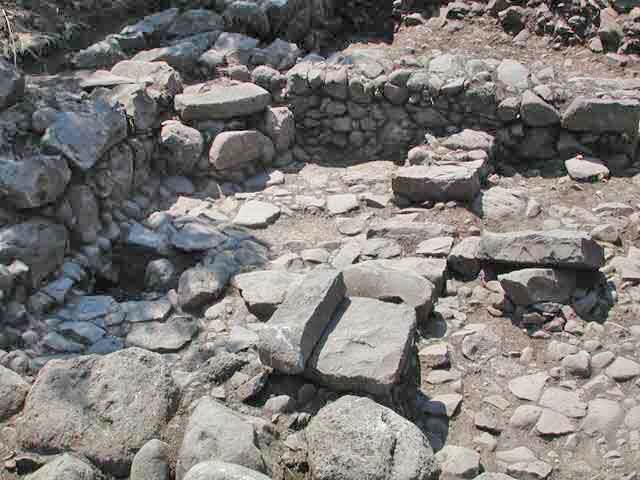 A number of rooms that were connected by doorways and had floors paved with basalt flagstones were exposed (figs. 3, 4). The lower millstone of an Olynthus mill that was set on top of a built installation was discovered in the southwestern room (Fig. 5). The finds included fragments of locally produced pottery vessels, cooking pots and cooking bowls, which were similar to the vessels manufactured at Kefar Hananya and in the Golan workshops, and jars that are also known from local workshops. In addition, fragments of lamps and a number of coins were found. The artifacts were dated to the second and third centuries CE. The building exposed in the excavation, which dated to the second and third centuries CE, was apparently destroyed by an earthquake at the beginning of the fourth century CE. The excavation finds join previous evidence that was uncovered in surveys and excavations at the site. The pottery vessels indicate that the residents of the site were Jewish and they used locally produced vessels. This is consistent with the results of excavations at sites, such as Qazrin and ‘En Nashut, even though no synagogue remains were found at Fakhura, probably because it did not exist at the time when synagogues were built in the region. 2. General view of the site, looking east. 3. Eastern room, looking north. 4. Western room, looking north. 5. Installation in northern corner of western room, looking north.